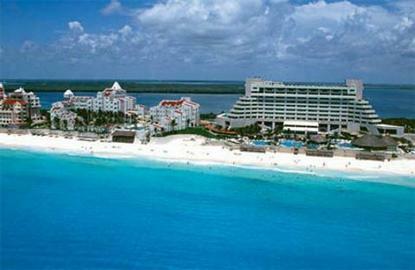 Royal Solaris Cancun All Inclusive is located on Cancun's most pristine strip of white sandy beach and the crystal clear turquoise water of the Caribbean Sea. We are only 15 minutes from the convention center and 20 minutes from downtown and the airport. Royal Solaris Cancun All Inclusive offers 500 beautifully decorated rooms presenting a combination of pleasant soft tones with modern accents and a touch of Mexican color distributed in two different style buildings the Royal Tower with an exclusive American style and the Caribe Tower with a relaxed ambiance in a Morrish-Meditteranean style structure. All of our guestrooms feature one king or two double beds, private bath with tub, shower and hairdryer, individually controlled air conditioning, alarm clock radio, satellite color TV featuring international programming with remote control, direct-dial telephone with voicemail system, safe deposit box and iron and board. Balconies available upon request and subject to availability at check-in. Hotel amenities include four freshwater swimming pools, a state-of-the-art fitness center plus eight restaurants, five bars and two snack bars. Our all-inclusive program includes deluxe accommodations, all meals, unlimited drinks, nightly theme parties and entertainment plus daily activities prepared by the hotel?s sports and entertainment for both adults and children.